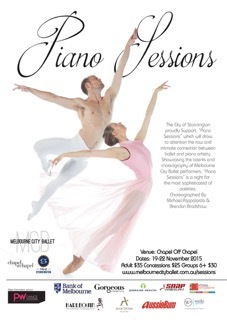 Stonnington City Council are proud to present the Australian premier of Melbourne City Ballet’s neoclassical season Piano Sessions at Chapel Off Chapel. Piano Sessions will draw attention the raw and intimate connection between neoclassical ballet and live piano artistry in a production designed for the most sophisticated of palates. One of their most intimate seasons, Piano Sessions features artists who brave to dance alongside a sole pianist, presenting and evening for the most sophisticated palates. Featuring four brand new works by Australian choreographers, including Artistic Director Michael Pappalardo, Former Royal New Zealand artist Brendan Bradshaw and Melbourne City Youth Ballet Director Yuiko Masukawa, Piano Sessions will provide audiences with the chance to experience why Melbourne City Ballet has continued to grow in prominence in recent years. All works are inspired by the beauty of movement and the piano score to reflect the true beauty of some of the best dancers in the country. You will see movement that is innovative and stylistic that pushes the dancers to their extremes of movement. These works encompass the exquisite lines and beauty of the dancers while tweaking classical movement to fuse a neo-classical style that is set to entertain. This is the second time Melbourne City Ballet has performed at Chapel Off Chapel this year following the success of The Magic Toy Shop during the City of Stonnington’s Roola Boola Festival earlier this year. Melbourne City Ballet’s Piano Sessions is set to be just as successful, with limited dates available, it is not to be missed! “We have spent much time this season exploring movement that is magical to the eye. Our artists and choreographers have worked to produce pieces that will leave audiences breathless” said Artistic Director Michael Pappalardo. “Melbourne City Ballet is renowned for its long lines and beauty of movement, often praised as a distinguishing factor of our artistry. We guarantee this is pushed to its extremes in this neoclassical season” said Pappalardo.